Animal Wildlife | Squid | The squid is a marine cephalopod similar to the octopus. Like all other cephalopods, squid have a distinct head, bilateral symmetry, a mantle, and arms. 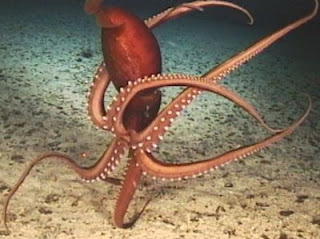 Squid, like cuttlefish, have eight arms and two tentacles arranged in pairs. Some species of squid are known to have 10 arms. There are around 300 different species of squid found in the oceans worldwide, with squid being one of the few animals that inhabits the freezing waters of the Antarctic, where they mainly feed on krill and plankton although larger species of squid have also been known to hunt larger prey like fish. Most species of squid average at about 20 cm in length when they are fully grown although some species will commonly grow to 60 cm long. The Colossal squid that lives in the deep waters of the Pacific Ocean has been known to grow to 14 metres long! 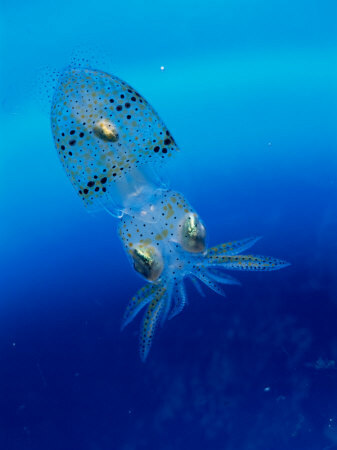 Squid are an excellent and therefore common food source for a variety a different animal species in the water but also those predators on land. 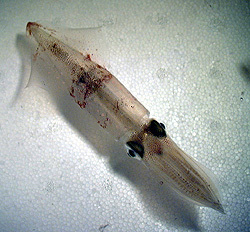 Squid predators include sharks, penguins, seals and humans. Generally squid will only get to a few years old in the wild before being eaten. Some of the bigger species of squid however, have been known to reach ages of 15 years old. Squid itu cumi-cumi. Salah satu produk perikanan yang banyak diminati. Sayangnya blm diketahui cara budidayanya, seperti cara budidaya ikan jenis ikan yang lainnya.